Then off we went to do some last minute grocery shopping for Little Buddy's dinner party and then home and lunch for the family. After we settled the kids for their afternoon naps, Hubby and I drove out to pick up the items for the party. Our guests all arrived punctually and by 6:30pm, eveyone was eyeing the feast laid out on the table. The birthday spread included fried noodles, chicken nuggets, fried prawns, homemade ngor hiang, fruit and vegetable salad, steamed white chicken, satay, mini mackarel otah, scallops, some greens and keropok. We were all so busy tucking in that no one remembered to take a photo shot of the food! The highlight of the evening was when we brought out the birthday cake from Blue Magnolia. 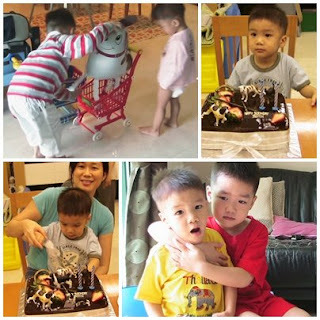 It was a 2kg BM Signature Chocolate Fudge Cake to which I added some figurine dogs as additional cake toppers. Both boys were more captivated by the dogs then anything else. After singing the birthday song for Little Buddy, Hubby said a birthday prayer and then Little Buddy proceeded to blow out the candles and cut his own cake. The cake was chocolatey yummy, light on the palette yet rich enough to satisfy the chocolate addicts. The fudge set rather nicely without being too gooey. The guests gave their thumbs up for the cake. To end off the feasting, we had cut fruits and a warm dessert of barley, gingko nut and bean curd skin. By this time, we could all hardly eat a morsel more. Both boys received mostly hongbaos which they promptly handed over to me for safekeeping, a long truck, more toy cars(!) and a pencil case each. Hubby also bought a pet dalmatian.....balloon for Little Buddy. Upon sighting, he ran towards it and to our amusement, wanted to 'sit' on it before Big Buddy had the bright idea of putting the dog onto the trolley for a ride. The day started and ended well. Both children were happy and that made Hubby and I happy too. Happy Birthday Little Buddy, my darling! Can I go to the pet shop?